We analyzed a county-level data set of rice yield and daily weather outcomes in China to examine the effects of high temperatures and extreme temperature events on rice yield. We found that (i) rice yield responded negatively to high temperatures (>29°C) and extreme temperature events, including cold and heat waves; (ii) rice yield exhibited highly nonlinear responses to temperature changes: rice yield increased with temperature up to 29°C and peaked with 1,550-1,800 growing degree-days; and (iii) holding current growing seasons and regions constant, average rice yield in China is projected to decrease by 11-50 percent by 2070 under future warming. 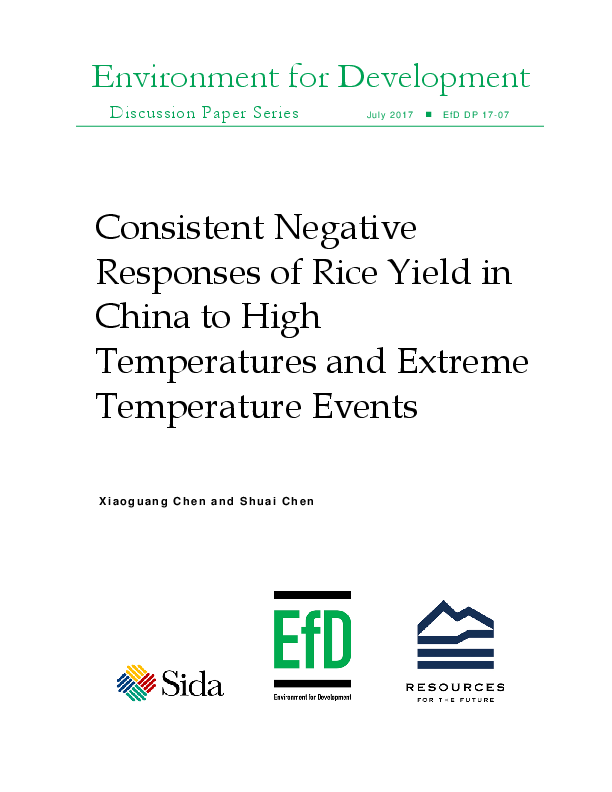 These results imply that both warming and extreme temperature events pose major challenges for Chinese rice farmers, and that the effectiveness of adaptations will depend on how well they reduce the negative temperature impacts on rice yield on very hot and cold days.